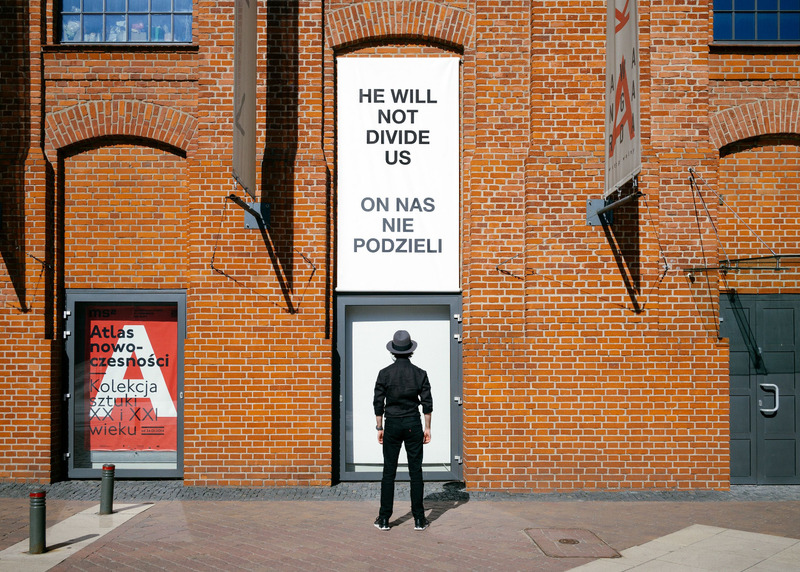 From 8 June 2018, LaBeouf, Rönkkö & Turner’s ongoing durational artwork #HEWILLNOTDIVIDE.US will be installed at Muzeum Sztuki in Łódź as a part of the exhibition Peer-to-peer. Collective Practices in New Art. The long-term durational piece is devised as a form of resistance to intolerance and the normalization of division. Initiated for the term of the 45th Presidency of the United States, the words “He Will Not Divide Us” function as both an appeal to resist social polarization, and a gesture of hope towards a collective spirit of unity. The project has existed in various forms under the wing of multiple institutions including the Museum of the Moving Image in New York, the Foundation for Art and Creative Technology in Liverpool, and Le Lieu unique in Nantes, France, where it has been installed since October 2017, and will continue alongside the Łódź exhibition. From the outset, the work has been subjected to numerous attacks from extremist factions in a disturbing affront to the artwork’s message of unity. The Łódź iteration of the project, like the original installations in New York and Albuquerque, foregrounds audience participation. A camera installed on the ms2 façade transmits live video to the website, www.hewillnotdivide.us. Visitors are invited to approach the camera and deliver or engage with the words “He Will Not Divide Us” in whatever way they wish, participating in the broadcast as a show of resistance or insistence, opposition or optimism, guided by the spirit of each individual participant and the community. Luke Turner (1982, UK), Nastja Säde Rönkkö (1985, Finland), and Shia LaBeouf (1986, USA) have been making art together since 2014 as LaBeouf, Rönkkö & Turner. Their participatory projects and performances utilise emotion and social interaction to foster new forms of communality across digital and physical networks. Their previous works include #ALONETOGETHER, Kiasma, Helsinki (2017); #ANDINTHEEND, Sydney Opera House (2016); #TAKEMEANYWHERE, BMoCA, Colorado (2016); #TOUCHMYSOUL, FACT, Liverpool (2015); #ALLMYMOVIES, New York (2015); and #IAMSORRY, Los Angeles (2014).